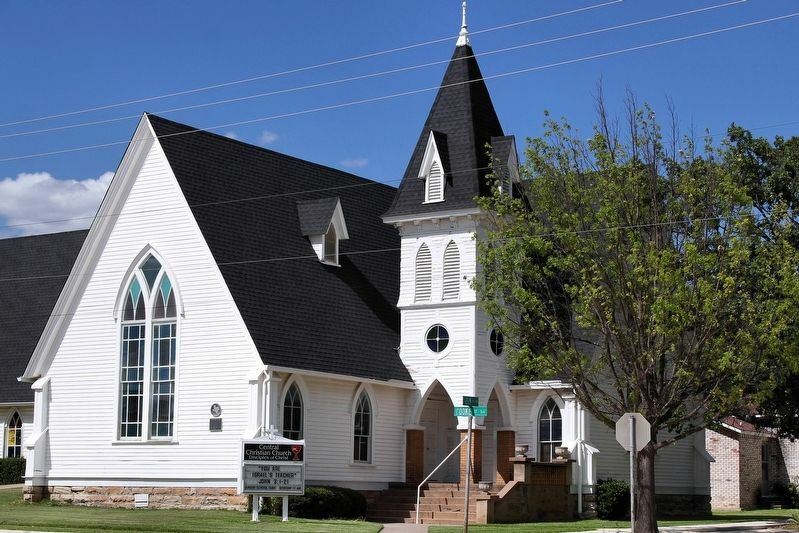 This sanctuary was constructed in 1894, six years after Central Christian Church was founded by The Rev. M.F. Smith. 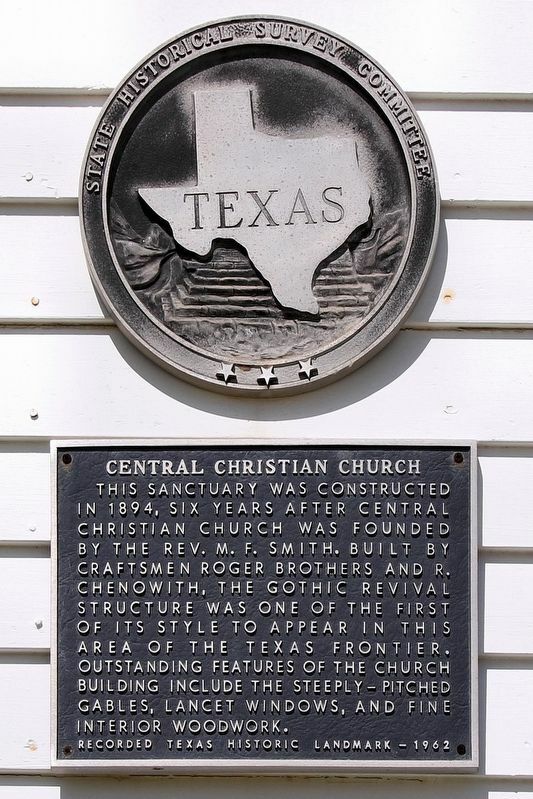 Built by craftsmen Roger Brothers and R. Chenowith, the Gothic Revival structure was one of the first of its style to appear in this area of the Texas frontier. Outstanding features of the church building include the steeply-pitched gables, lancet windows, and fine interior woodwork. Location. 33° 47.411′ N, 97° 43.582′ W. Marker is in Nocona, Texas, in Montague County. Marker is at the intersection of Cooke Street and East Elm Street, on the right when traveling north on Cooke Street. Touch for map. Marker is at or near this postal address: 300 Cooke St, Nocona TX 76255, United States of America. Touch for directions. (approx. 1.2 miles away); United Methodist Church of Montague (approx. 8.8 miles away); Montague Catholic Cemetery (approx. 9.2 miles away); Spanish Fort (approx. 12.4 miles away); Site of the 1759 Taovayo Victory Over Spain (approx. 12½ miles away); Head of Elm (approx. 13.4 miles away). Touch for a list and map of all markers in Nocona. Credits. This page was last revised on June 27, 2018. This page originally submitted on June 26, 2018, by Larry D. Moore of Del Valle, Texas. This page has been viewed 43 times since then and 8 times this year. Photos: 1, 2. submitted on June 26, 2018, by Larry D. Moore of Del Valle, Texas. • Bernard Fisher was the editor who published this page.